This hockey mom necklace includes a 3/4" sterling silver round charm stamped with my exclusive crossed hockey sticks design as well as "Hockey Mom" in my typewriter font. I have many other sports available, and I welcome custom orders using my other sports that I offer! The chain is an 18" sterling silver cable chain. 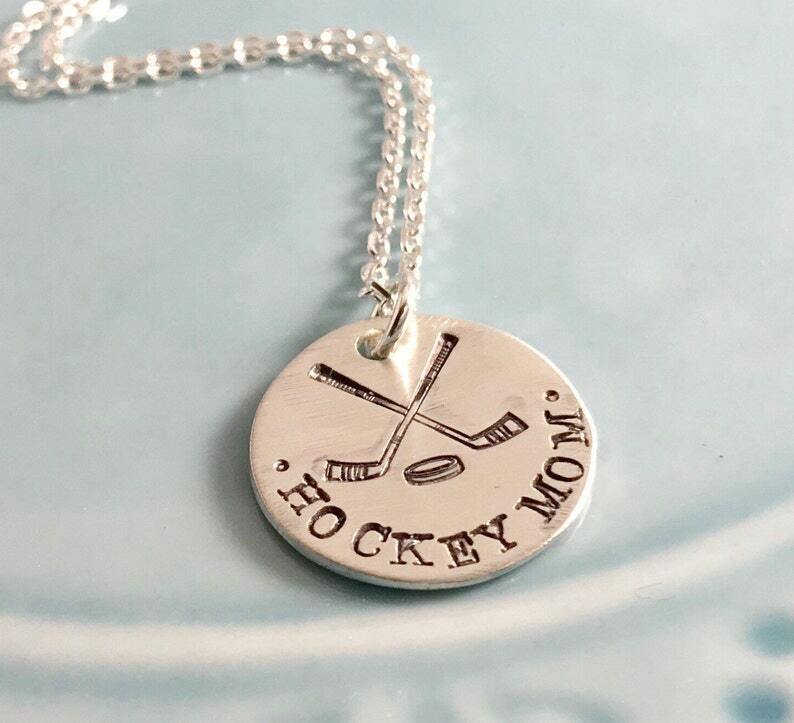 - preference on "mom" or "mama" to be stamped Could also be "nana" or "Grandma"
Hand stamping is the art of placing individual letter, number, or design stamps on metal and imprinting the design by hammering it into the metal by hand. Therefore, no 2 pieces will be the same, and likely won’t be perfect either. This is what makes hand stamping unique and sets it apart from engraving. Jewelry will come on printed card and wrapped in a cellophane package, then placed in a square kraft box with my logo sticker and tied with ribbon. I accept credit cards through Etsy's direct checkout feature as well as PayPal. Payment is made up front, and your card is charged at the time of purchase, not when your item is shipped. If a refund is made, it may take a few days for it to process. I have no control over this, it is how electronic funds are transferred, so patience is appreciated! Also, I do not have access to your card info... all of that information is encrypted and your information is very safe and secure! I can only issue refunds and not make additional charges to your card for additional add-ons, ect. -Cancellations can only be made if I have not started on your order. -Refunds and exchanges are allowed on non-personalized items only within 30 days of purchase. "Did you know? You do not need a PAYPAL account to use it? You can use them simply, to safely process your credit card. 2. Click the green "Check Out with PayPal" button. 3. In the page that comes up, (instead of logging into PayPal or signing up for an account), click the link on the left side of the screen: "Don't have a PayPal account? No problem, continue checkout." 4. You will be taken to a screen where you can enter your credit information to complete your order." If you are not totally satisfied with your jewelry, please let me know so I can make it right. I cannot be responsible for breakage due to misuse. I will replace or repair a piece that breaks due to a defect in workmanship within 90 days. If it is past 90 days, please let me know and we can discuss a resolution. Personalized items are stamped as you request. If you make a mistake in spelling, I will be happy to remake it for you at a slight discount. If it is my mistake, I will replace for you. Personalized items cannot be returned for a refund. Non-personalize pieces can be returned for a refund or exchange within 30 days as long as the piece is in new condition and has not been worn. Refunds or exchanges must be approved ahead of time via the convo system on Etsy. You have the option to upgrade to priority or express during the checkout procedure. These options only affect your shipping time, not processing time which is stated in my shop announcement. -I ship to the address listed on your Etsy account. If this address is incorrect and results in your package being returned to me, I will reship for you for an additional fee. I will not accept returns on personal items or items returned to me for incorrect addresses. - If you need your item sooner than the stated time frame, I may be able to accommodate that if you contact me ahead of time. During busy times of the year, and expedited fee may apply to complete your order ahead of my posted schedule. -All jewelry will be shipped within the time frame stated in my shop announcement. An extra fee will apply for expedited order processing and shipping. All pieces (except memory locket discs and charms) are packaged nicely in on a jewelry card with care instructions, and then into an organza bag. It is suitable for gift giving :) Memory locket discs and charms are packaged in a small zip lock bag and attached to a jewelry care card. Leather cuff bracelets are packaged and shipped in a sturdy kraft jewelry box. *******Shipping Changes.... The USPS has increased international shipping costs substantially. Unfortunately, that means that I too must increase my shipping cost. The good news is that international tracking is available . You can check your invoice by clicking on the blue "your account" tab at the upper right hand corner of your screen. Choose "purchases" from the drop-down menu. This will open a page with all of your purchases from Etsy. If you have multiple orders from different shops, they will all be listed separately. Click on the view receipt button for your actual invoice. The shipping date is listed near the upper right of your screen near your shipping address. I do my best to ship ahead of this date, but occasionally, unforeseen events may cause delays. HOW LONG DOES IT TAKE TO MAKE MY ITEM? ****Current production time is approximately 1-2 weeks***** This does not include shipping time which can add an additional 3-7 days. IF YOU NEED YOUR ORDER BY A CERTAIN DATE, PLEASE CONVO ME. IF YOU LEAVE IT IN THE NOTES TO SELLER SECTION AT CHECK OUT, I MAY NOT SEE IT UNTIL I AM WORKING ON YOUR ODER. I will do my best to accommodate requests :) Your receipt may include a ship by date as well. Please be advised that shipping can take much longer due to customs. International customers are responsible for any additional taxes and fees that your country charges. Sometimes these can add up. Please be aware of this when you order. Depending on your countries current customs laws, I may or may not be able to fill your order. I will contact you if I have to cancel your order. If ordering your item as a gift, please note that I must include an invoice in the order and there may be customs fees associated with the package. I cannot mark it as a gift, this against the law. If you plan to order as a gift, I suggest allowing extra time to have the package shipped to you, then you can ship to the gift recipient. Thank you for understanding. *********UK CUSTOMERS: YOU MAY ALSO BE ASSESSED A HANDLING CHARGE OF APPROXIMATELY 8 POUNDS ON TOP OF DUTY FEES AND CUSTOMS FEES. THIS IS NOT A SHIPPING FEE ON MY END. THIS IS A FEE ASSESSED BY YOUR COUNTRY. ********* If you do not pay these fees and your package is shipped back to me, I will be unable to refund your purchase. By purchasing with me, you are agreeing to these terms. WHERE CAN I FIND THE LATEST INFO ON ANDIE STEVENS DESIGNS?